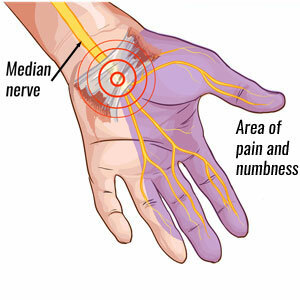 Carpal tunnel syndrome is caused by compression of the median nerve resulting in chronic wrist pain. Symptoms include a dull ache, numbness or pins and needles in the wrist and forearm, which may radiate into the hand and fingers, and is often worse at night. Treatment includes rest, bracing and in some cases surgery. Symptoms of carpal tunnel syndrome usually develop gradually over time and may initially only be present at night. It can occur in one hand, or both at the same time. A dull ache in the wrist and forearm is felt with pain which may radiate into the thumb and four fingers of the hand, but not the little finger. The patient may feel sensations of tingling or burning pain in the thumb and first three fingers of the hand. Pain is often worse at night and can radiate into the forearm, elbow or even shoulder. The patient may also have weakness in the hand and fingers and have difficulty gripping things. Phalen’s sign is where the patient bends the wrists to push the backs of the hands together, holding for 1 minute. If the test is positive then tingling that radiates into the thumb, index finger and the middle half of the fourth finger will be felt. Tinel’s sign is where the therapist taps with two fingers over the palm side of the wrist. Carpal tunnel syndrome could be considered if there is a tingling sensation or other symptoms are reproduced. Investigations may also be performed to confirm the diagnosis including MRI scan, ultrasound imaging, electromyography or a nerve conduction study. Carpal tunnel syndrome is caused by compression of the median nerve in the wrist as it passes through a narrow channel in the wrist called the carpal tunnel along with the tendons of the flexor digitorum superficialis and flexor pollicis longus muscles of the forearm. 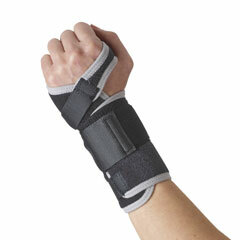 Traumatic wrist injury such as wrist sprains and broken wrists. Repetitive strain injury or RSI caused by overuse of the wrist. Pregnancy which causes fluid retention in the wrist. Use of vibrating machinery which may cause damage or inflammation to the soft tissues. It may be congenital meaning some people naturally have a smaller, narrower carpal tunnel. 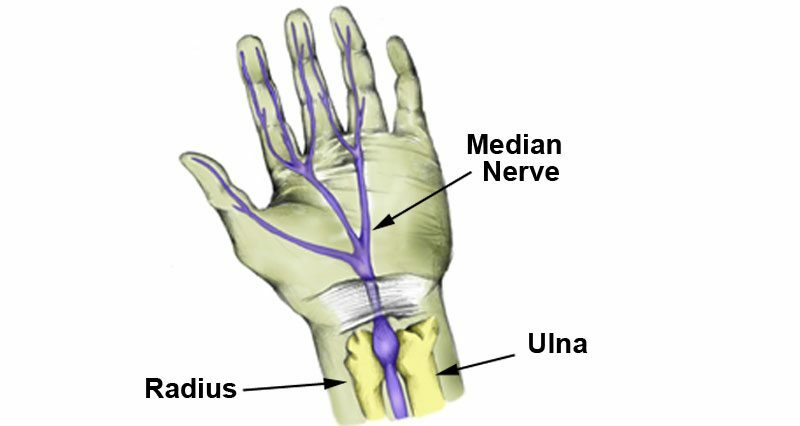 All of these conditions can cause a narrowing of the space through which the median nerve passes. Symptoms are three times more common in women, probably because they have a smaller carpal tunnel. It also has a higher prevalence in people with diabetes and other conditions which directly affect the nervous system. It usually occurs first in the dominant hand and sometimes but not always occurring as well in the nondominant hand. Some professions are more at risk of developing carpal tunnel syndrome, especially people working on an assembly line, who are continually repeating the same movement. Treatment should initially be conservative which means without surgery. If after conservative treatment has been tried for a few weeks and not been successful then surgery is often considered. Rest – Rest from activities which cause pain or make it worse. Continuing to use a painful wrist will not allow inflammation to settle down and soft tissues to heal. This may include work-related activities such as typing at a keyboard, DIY or sport specific training including racket sports. If you are an athlete then use this opportunity to work on another aspect of your game or maintain fitness with aerobic exercise. Carpal tunnel wrist splint – A carpal tunnel wrist splint can be worn to immobilize the wrist joint helping you to rest the joint whilst allowing some function of the hand. The wrist splint is usually made of a thick supportive neoprene material and has a metal spoon or support along the wrist to prevent movement. Ice or cold therapy – If there is inflammation and swelling present, using a form of cold therapy will help to relieve this. Applying ice or a specialist cold wrap to the wrist area for 10 minutes at a time can be done hourly in the early stages, reducing in frequency as required. Medication – Your Doctor may also prescribe anti-inflammatory medication such as ibuprofen to reduce inflammation, or diuretics to clear fluid retention. Acupuncture – Other treatments, which may be worth trying include acupuncture which has been linked to an improvement in carpal tunnel syndrome symptoms. Acupuncture is performed by inserting needles of various lengths and diameters into specific points over the body. The needle is usually inserted, rotated and then either removed immediately or left in place for several minutes. Injections – If symptoms do not improve other options include Corticosteroids or lidocaine injections. If all of this treatment fails and symptoms persist over a 6 month period, surgery may be required. Following a period of immobilization, stretching and strengthening exercises can be used to help prevent symptoms returning. All exercises should be performed pain-free. If pain occurs, go back a step or rest for longer. Initially, mobility and gentle stretching exercises should be done to restore full pain-free range of motion at the joint. Later static strengthening exercises can begin which do not involve movement and finally, normal strength can be restored by dynamic exercises involving movement with resistance bands or dumbbell weights. Exercises to stretch the muscles surrounding the wrist can help to ensure the tendons which pass through the carpal tunnel are in good condition. 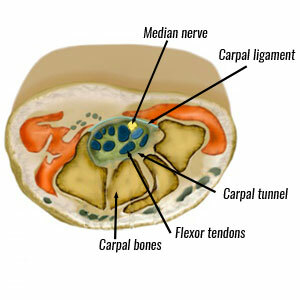 Tendon injuries can sometimes cause carpal tunnel syndrome. Isometric carpal tunnel wrist exercises – Start with isometric exercises which involves contracting the muscles against resistance, without movement. These are very low-level exercises which should be used at the first point of strengthening. Make a fist with your affected hand. Place the other palm on top of your hand (near the knuckles). Try to extend your wrist (bend it back), using the hand on top the resist the movement. Wrist extension – Concentric exercises are those which involve movement such as when using a dumbbell. These are more difficult than isometric exercises. Perform wrist extension using either a dumbbell (1-2kg) or a resistance band. Make sure the forearm is supported on a table, bench or even your lap. Perform slowly and under control. Start with 10 repetitions and gradually increase up to two sets of 20. Do the same with wrist flexion – turn the wrist over so the back of the arm/wrist is resting on a table or bench and curl the wrist up towards you. Wrist flexion – Exactly the same is done as for the wrist extension exercise above except the wrist and arm is the other way up. The palm is facing upwards and the exercise is performed in a slow and controlled manner. Start with 10 repetitions and gradually increase up to two sets of 20. Do the same with wrist flexion – turn the wrist over so the back of the arm/wrist is resting on a table or bench and curl the wrist up towards you. 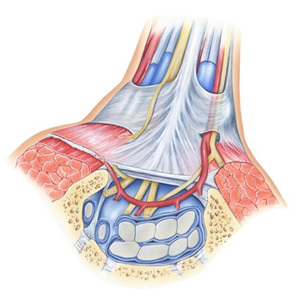 Surgery for carpal tunnel syndrome is a carpal tunnel release and is a very common operation, which involves cutting the carpal ligament to make more space for the median nerve. This can either be done as an arthroscopic operation (keyhole) or as an open release, where a 5-6cm incision is made. It is a straightforward procedure which is usually carried out on an outpatient basis. Your hand and wrist will be bandaged and may be placed in a sling for a few days to help it rest and reduce swelling.